You are all invited to the reception for the “About Face” exhibit! Please note that we have a date change for the reception. It will now take place on Sunday, January 20th, from 1 to 3 pm. As with our other events, the reception is open to everyone, so be sure to share and invite your family and friends! There is still a chance to participate in the show! The last day to drop off artwork is tomorrow between 12 pm and 5 pm at the South Avenue Arts in Garwood. We hope to see you there! Take a look for more details about the show below. January show at South Avenue Arts. ABOUT FACE: These two words can simply mean “Pertaining to the face or front of someone or something”. It is also a common expression as in “A complete change of opinion or policy; or a turn made as to face the opposite direction. Either way this theme is taken, we know artists have such distinct ways of representing the same underlying theme within their works that we can expect to see a varied array of art and we will be able to compare the methods and journeys artists use to convey the same underlying theme. The artworks that are inspired by “About Face” may prove to comment on our turbulent times or give us cause to turn in the opposite, more introspective direction. 2-D and 3-D work will be considered. Each member may submit one piece to the show. Space permitting, we may open it to more. Delivery of Artwork: Wednesday Jan 2nd (10am – 9pm) and Thursday Jan 3rd (12-5pm). All accepted work must remain in the gallery for the duration of the exhibit. All work must be available for sale. Reception: Saturday Jan 5t (7-9 pm). Pick up of Unsold Work: Wednesday Jan 30th (10am – 9pm) and Thursday Jan 31st (12-5): Pick up unsold work during gallery hours. Work will be considered for sale at the price indicated. If sold, 60% of the selling price will be paid to the artist and 40% will be retained by South Avenue Arts. Artists will receive payment within 30 days of show completion. Great care will be taken with all work, but artists are responsible for insuring their own pieces if they wish. South Avenue Arts will not be responsible for any loss or damage to work while on the premises or in transit to or from the gallery. Artists are advised to obtain their own insurance. 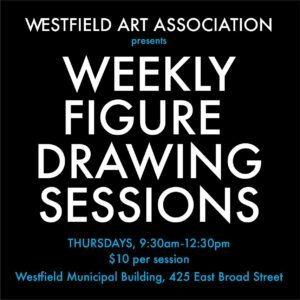 The Westfield Art Association will make every effort to treat your artwork with care. However, work is submitted at the artist’s risk. The Westfield Art Association, its Board of Directors, South Avenue Arts and it’s owners & employees, will not be held liable for lost or damaged work. Artists are responsible for insuring their work from delivery through return & pick-up. Artists will be responsible for delivery and return shipping of all their artwork. Shipped work must be packaged in a reusable container. A prepaid waybill for its return must be enclosed. Please make shipping arrangements through the U.S. Postal Service, DHL, FedEx, or UPS. COD returns are not acceptable. The gallery accepts no responsibility for work not retrieved on the pick-up date.